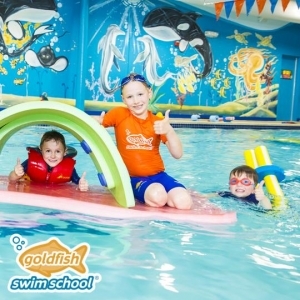 Goldfish Swim School represents more than just a passion for kids or a passion for swimming, it is a special passion for changing and even saving lives by teaching kids to swim. We have created an inviting and safe place where kids overcome their fears, learn to swim, respect the water, and have lots of fun while doing it. Our award-winning tropical environment and shiver-free pools are simply the fun backdrop for where kids do some serious growing and learning. So while we are focused on the serious stuff, your family will be focused on the fun. It is what we call The Science of SwimPlay ®. Sun, 4/5 -- Free first Sunday! With Earth Day coming up, dig right in by creating at the Barnes!